One of the loveliest things about the bespoke industry is the preponderance of open, generous people – in sharp contrast to the pretension of fashion. But while I have got to know many of our industry’s enthusiasts over the years, no one quite compares to Xavier Aubercy (above, second from the right). The man virtually bounces around the room. The day after my last visit Xavier emailed to say that it had been a “beautiful encounter”. And I actually agreed with him. 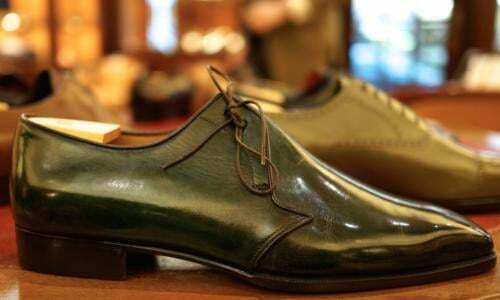 Aubercy is a French shoemaker that specialises in high-quality readymade shoes, and made-to-order. 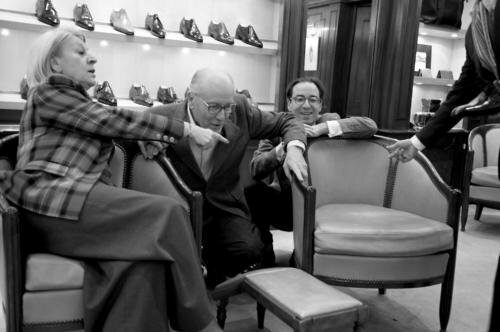 It was founded by Emile Aubercy in 1956, in the same store as the family’s existing menswear boutique. 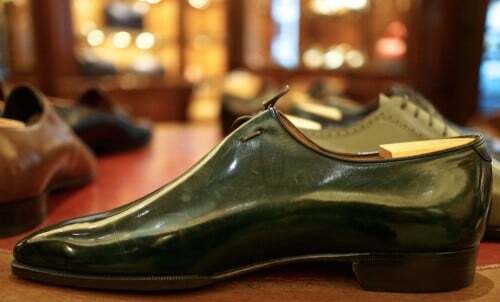 Emile, Xavier’s grandfather, had a passion to improve the quality of readymade shoemaking and that has continued over the years, with Aubercy now one of a very small number of shoemakers offering hand-welted ready-to-wear. Emile passed the torch to his son Philippe and his wife (both pictured above) in 1970; Xavier took over in 1995. Aubercy’s other main selling point is its made-to-order shoes. It consciously seeks out new designs and formulations, and is particularly excited to take on the ideas of others. For around €1500, Aubercy will make anything you could conjure up, from tweed button-boots to a one-sided, wonky Derby (Besteguy, below). You can see the range of orders on the Mesure section of the website. 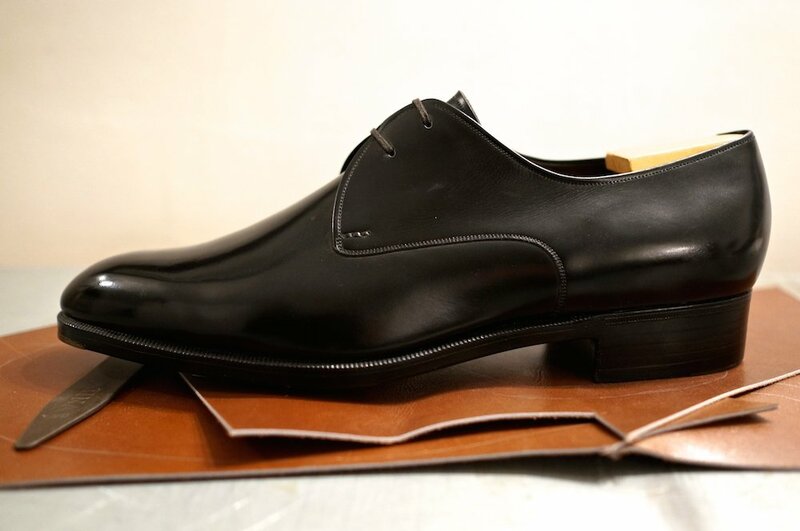 Aubercy has tried bespoke in the past, although interestingly it is one of few shoemakers to approach bespoke this way round – most start with bespoke and then go into RTW shoes. 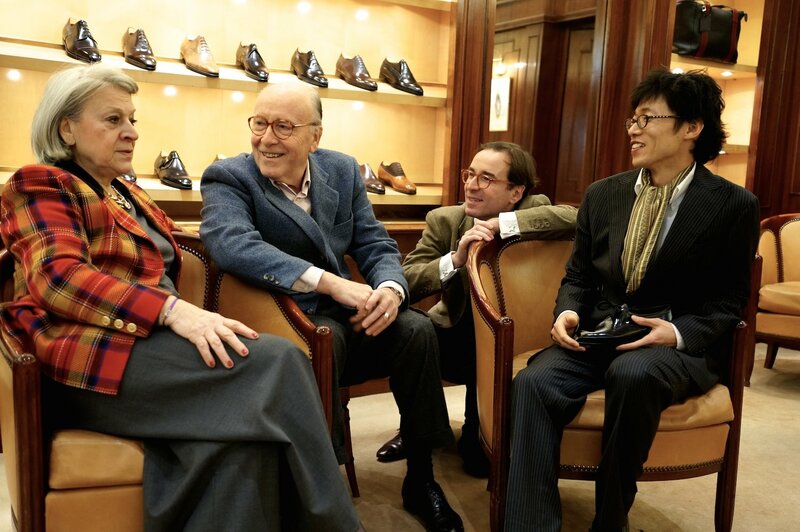 Seven years ago it started offering bespoke with Didier Martinez, ex-Berluti. That didn’t work out in the end, however, and he left after four years. Xavier took a long time to try bespoke again, unsure whether it was worthwhile, but has finally taken the plunge. As of this year Aubercy is offering bespoke under Yasuhiro Shiota (pictured with the family, far right), who was until last year at Corthay. His initial models have a little Corthay flavour, although he is also inspired by the old Aubercy styles, some of which are stunning. “I loved working with Pierre at Corthay, but wanted somewhere where I could set up my own operation and develop it,” Yasu tells me. When we met in November, he was just in the process of getting his workshop set up downstairs, and in fact Xavier surprised him with his first box of business cards. Xavier, typically, took great delight in the gift. 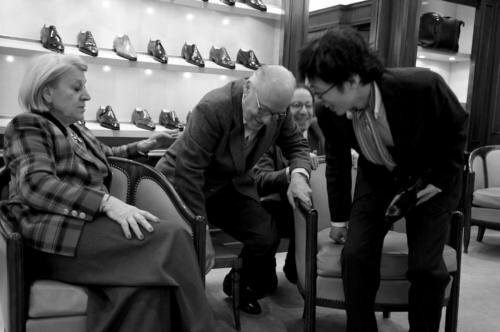 You can follow the discussion on Aubercy shoes, Paris – made-to-order enthusiasm by entering your email address in the box below. You will then receive an email every time a new comment is added. These will also contain a link to a page where you can stop the alerts, and remove all of your related data from the site. A little too Euro for me! Xavier is a wonderful man indeed. 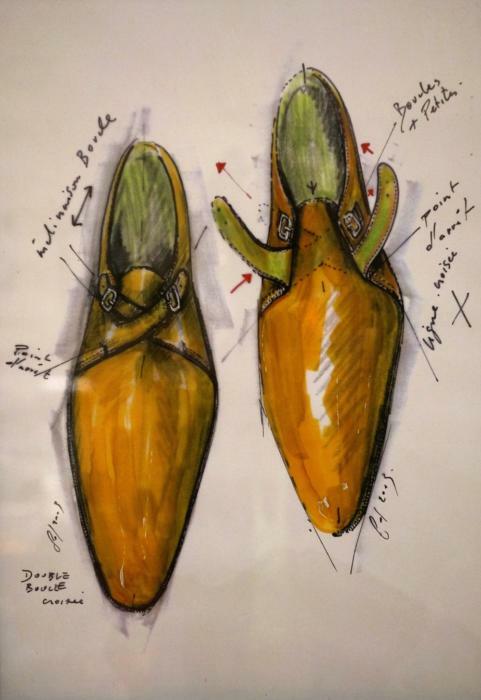 What do they charge for bespoke shoes? Clarification from Xavier: they have started bespoke with one or two customers, but haven’t officially launched bespoke, with the full range of models. They will announce prices with that official launch. In 2017, the starting price for a pair of bespoke shoes with Yasuhiro Shiota is €4900. 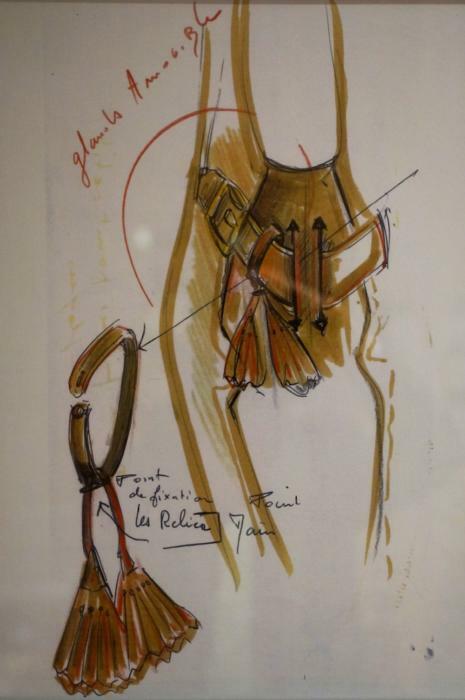 Would love to see a take on those crossover monkstraps in a slightly more English style, perhaps G&G or Cleverley. Thoughts Simon? Does he have his own workshop and where is it (not that it really matters)? I’ve heard Enzo Bonafe makes their RTW and MTO. They don’t have their own workshop, no, but they have worked with the same workshop for 30 years. I agree – it doesn’t matter, only the quality does.